Schaltbau S800 series snap-action switches feature positive opening operation which guarantees a reliable opening of NC contacts even when welded due to short circuits or overload currents. 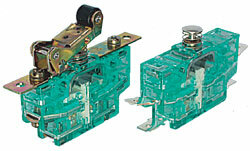 The switch can be offered in a variety of styles and operating arrangements. The inclusion of blowout magnets can increase the breaking capacity or the operational life.